Rock-hard ice cream is the bane of my culinary existence. If I try and scoop it out with a spoon, the spoon invariably bends. If I use a traditional ice cream scooper, I end up with a torqued wrist and one or two pathetic curls of ice cream for my efforts. The answer? Use a knife and cut up that bad boy into slices instead. Just turn that pint of ice cream on its side and cut a slice from the bottom. Unpeel the wrapping. Put ice cream in a bowl. Enjoy. Some people will run their scoop under hot water instead, but if you don't have a scoop, you'll still run the risk of bending a heated spoon, though that trick works well when you're actually eating your serving. Also, slicing just happens to be the easiest way to make an ice cream sandwich. I first heard about this tip from We're Calling Shenanigans. 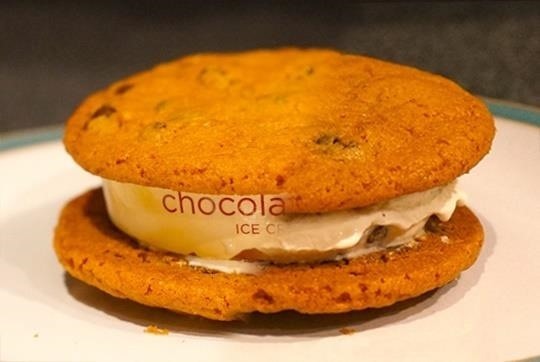 Just slide that slice of ice cream in between two cookies. 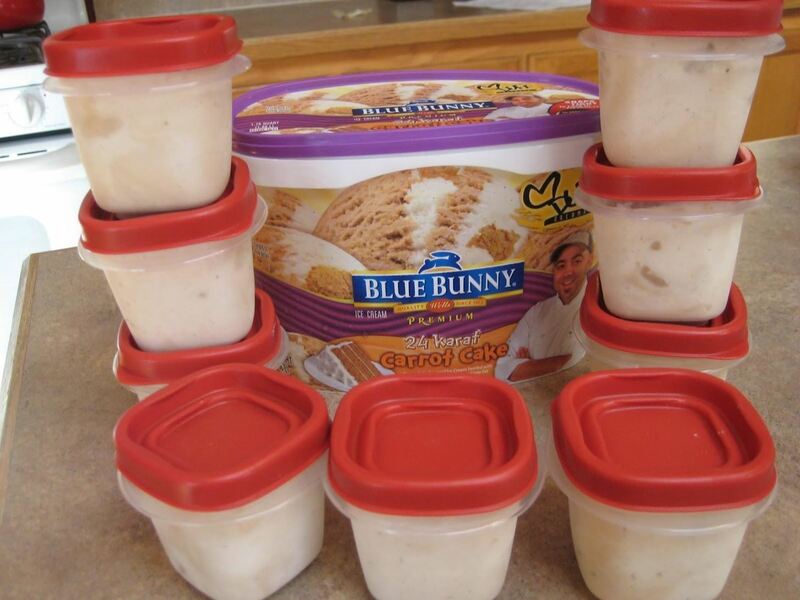 You can store the rest of the ice cream in a large plastic or glass container, or just throw the remaining tub into a large ziplock freezer back if that's all you got. 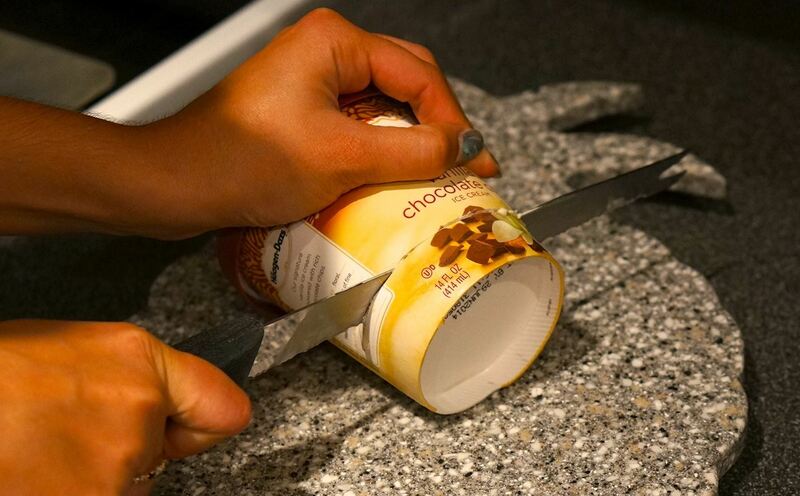 If you're really thinking ahead, you can slice up the entire pint and save it in individual containers so you only have to go through the process once. This is also good for portion control, as Runs for Cookies points out. If you're too cheap to buy individual containers, grab a few extra cardboard ones the next time you go to the local frozen yogurt shop, or save some of those plastic containers the next time you get Thai food delivered. These thrifty vessels aren't designed for freezers, but they'll last just long enough if you're into ice cream like I am. 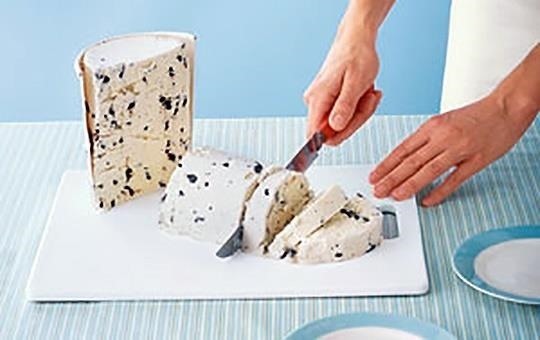 This slicing trick also works well on quarts of ice cream if you're serving a large number of people, as Real Simple demonstrates in the picture below. Cut a quart of ice cream down the middle, then place the flat slide down and cut into slices. Repeat with the other half. What's your favorite way to serve up rock-hard ice cream?